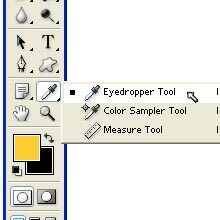 Eyedropper Tool is just below the shape tools and beside the pen tool.This tool is a color selection tool.With the help of Eyedropper Tool, we can view the color of single location.If we want a particular color which already exists.In such type of situations,eyedropper tool is very useful to us.With this tool, we can select a color which already exists. This is the Eyedropper Tool.Just go onto that tool and click on it to select it. 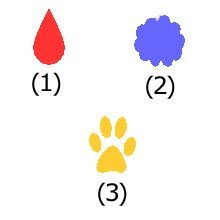 For example, if we have drawn these three shapes with different colors with different specified numbers. 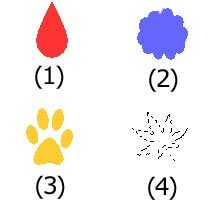 Now we have drawn this shape (4). 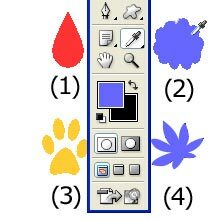 Here if we want to fill the color of number (2), then go to the eyedropper tool, select it and now go the shape (2) and click on that color.Now automatically that color will be selected in the "set foreground color".Now go the shape (4) selection and fill the color which we selected.